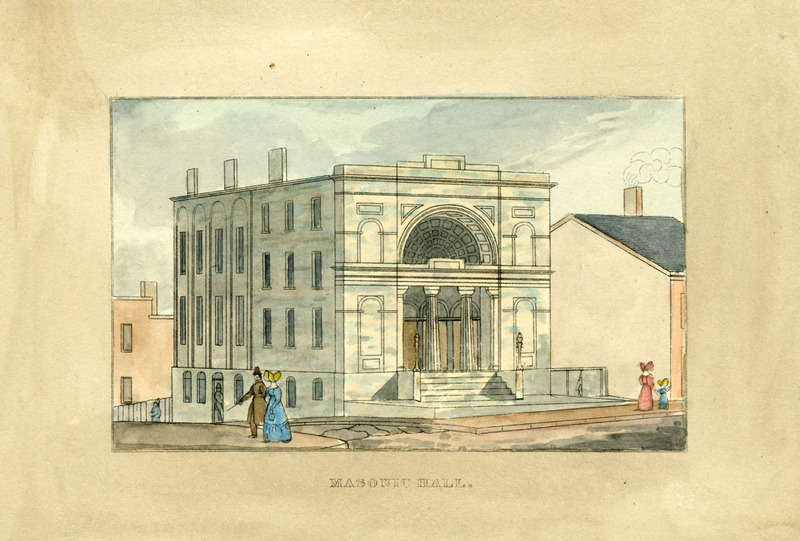 On May 16, 1814, the Grand Lodge of Maryland laid the cornerstone for the new Masonic Hall on St. Paul’s Lane. The new hall was designed by French architect Maximilian Godefroy and built by Colonel Jacob Small and Colonel William Steuart. Maryland Governor Levin Winder, Esq., serving as the R.W.G. Master of Masons led the ceremony. Masonic Hall from J.H.B. Latrobe’s Picture of Baltimore (1832). Johns Hopkins University Sheridan Libraries, F 189.B1 P53 1842 QUARTO.